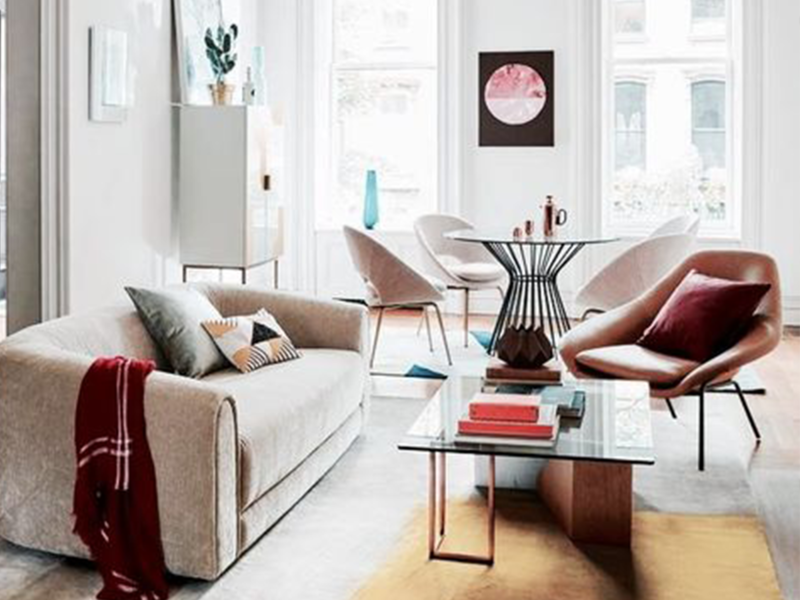 Many people think mid-century living rooms are defined by the ottomans, sofas and lounge chairs, but good mid-century design combines permanent aspects of the room with the furniture to make a comprehensive layout. Great mid-century design is clean and almost austere in its minimalism. 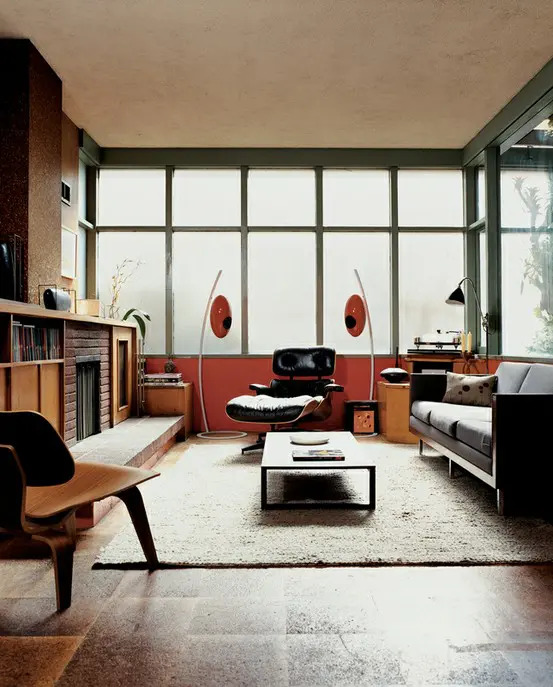 A mid-century modern image search brings up many good living room designs but also shows many poor design ideas because of lighting, clutter, and confusing design crossover. The following images showcase minimalist and mid-century design trends. This room showcases Scandinavian and Danish tastes for clean lines and clear spaces while sporting mid 20th Century furniture and living room rug. 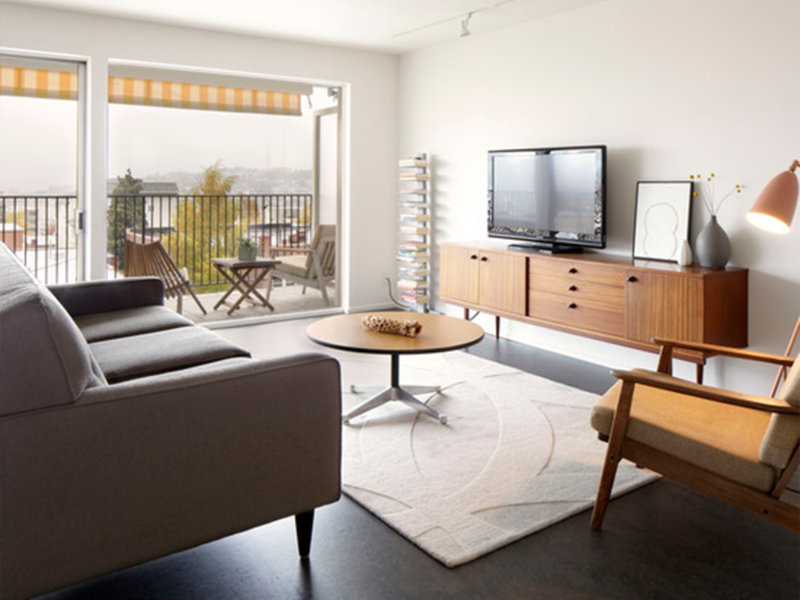 From the leather sofa to the mid-century sideboard storage, this room has a retro feel. While the furniture is moving to a late century feel (70s-80s), the minimalist room layout keeps the feeling of disco retro from getting overwhelming. 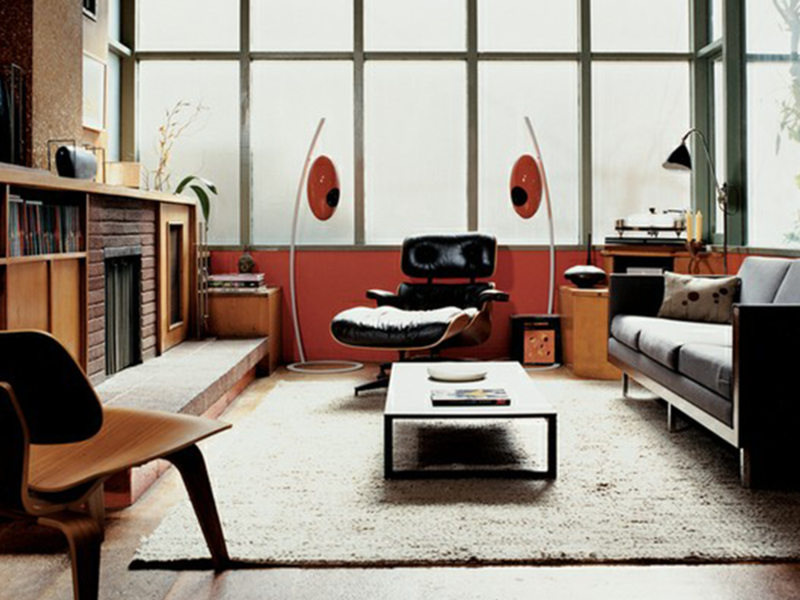 This living room returns to the more neutral colours and furniture of classic mid-century designs. The leather sofas offset the light walls and rug, and the globe lighting matches the circular pictures on the wall to offset a very straight-lined living room. The fabric furniture in this living room and dining room combination shows how mid-century fabrics soften minimalist designs so that a room can be furnished simply according to utilitarian needs but still feel comfortable. The blanket, books, and French press on the table present a lived in appearance, but the simple furniture of a sofa, lounge chair, four dining room chairs and two tables would feel Spartan if it wasn’t for the soft furniture. This apartment living room has many contemporary minimalist features, including the art, stand-alone shelving unit, and the floor to ceiling windows. The wood armed lounge chair and grey 3-seater sofa work well with the contemporary feel and 21st-century technology. 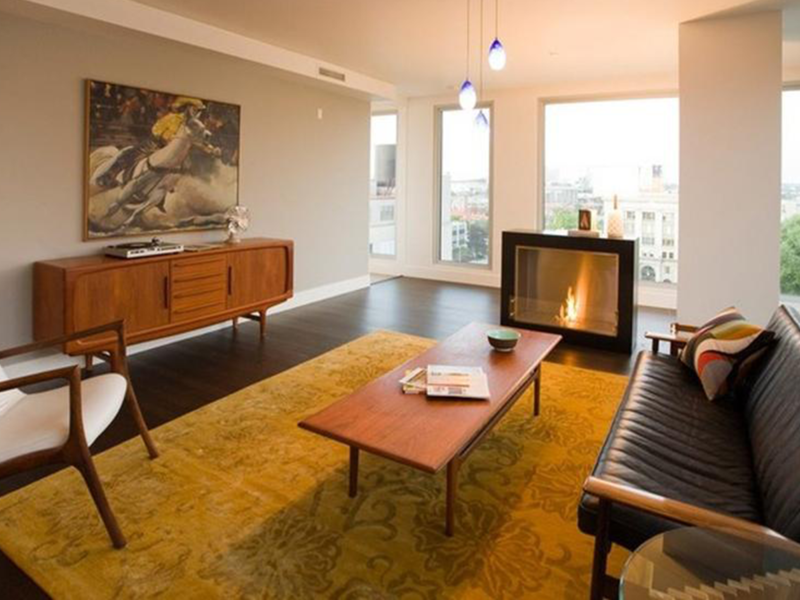 The mid-century modern furniture in this den/living-room showcases how you can incorporate the geometric shapes of mid-century modern with something more cozy than people often associate with the clean lines of mid-century modern design. 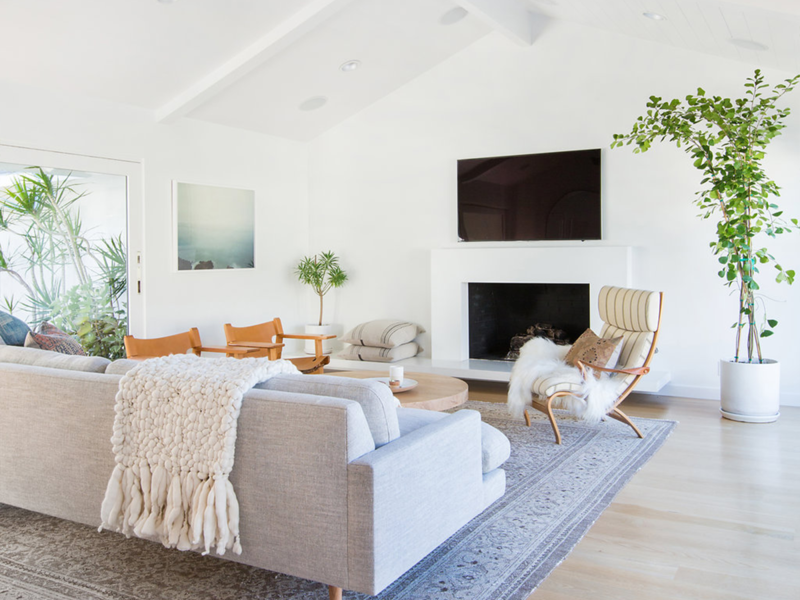 The natural wood floors, modern furniture, and clean walls with a high ceiling set this living room apart from all the others in this list. 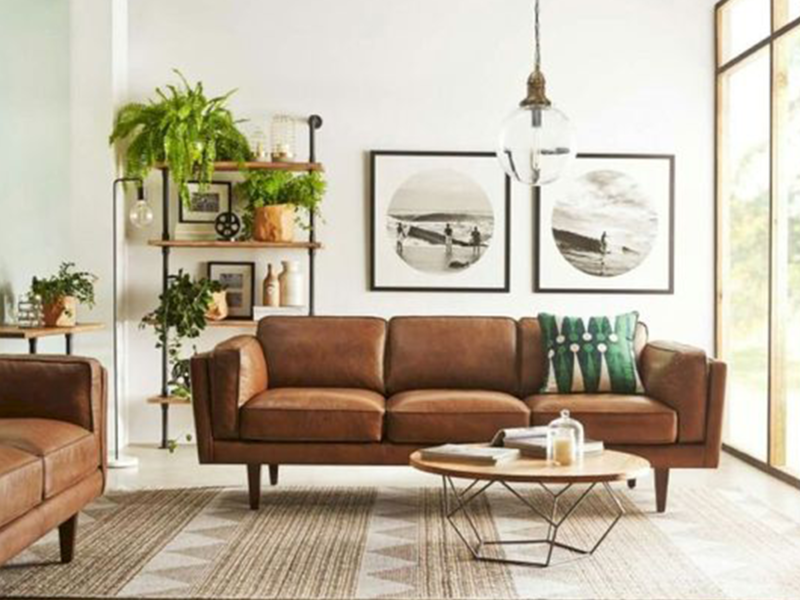 Both mid-century modern and contemporary minimalist design rules are followed in this piece and showcase how to use mid-century modern furniture to create a clean, minimalist, and even comfortable living room space.